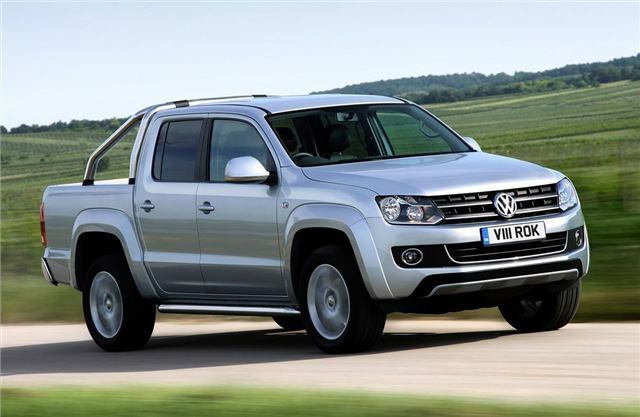 Prices for Volkswagen's new Amarok double-cab pick-up will start at just £16,995 for the Startline model with the mid-level Trendline priced at £18,995 and the top Highline costing from £21,575. The stylish four-wheel drive is available with the choice of two refined diesel engines. There's the powerful but efficient 2.0-litre BiTDI 163bhp engine, while an entry-level 2.0-litre TDI 122bhp is available on Startline models. All models are equipped 16-inch alloy wheels, 4MOTION Selectable four-wheel drive, electric front and rear windows, semi-automatic air conditioning and single CD stereo. The 4MOTION Selectable four-wheel drive system offers a choice between rear-wheel drive, four-wheel drive and low range four-wheel drive via a button on the dashboard. All models have a gross vehicle weight of 3170kg and more robust suspension which results in a payload of over 1045kg. The mid-level Trendline model gets two-zone automatic air conditioning, an RCD310 CD stereo, cruise control, a multifunction computer plus a leather-trimmed steering wheel, handbrake and gear lever. Colour-coded mirrors, front bumper and wheelarch extensions along with front fog lights and 17-inch 'Aldo' alloy wheels give the Trendline a bold look. The top Highline trim has chrome detailing on the front grille, door mirrors and rear bumper along with polished stainless steel sidebars, privacy glass and 18-inch 'Durban' alloy wheels. Other extras include leather upholstery, heated front seats and rear parking sensors. In addition to the 4MOTION Selectable system, the Highline model is also available with the option of 4MOTION Permanent. This permanent four-wheel drive system reduces the payload to below 1045kg but, thanks to comfort suspension which uses a two plus one leaf spring system, offers a more car-like driving experience with improved ride and refinement. A comprehensive range of optional equipment is also offered across the Amarok range, allowing owners to personalise their pick-up to their own individual needs. These include satellite navigation, additional protection for the load bay and underbody components, as well as exclusive 19-inch 'Aragonit' design alloy wheels.